Backbench MP Diane Abbott has joined the race for the Labour leadership. The Londoner told the BBC her bid was "serious", saying there was little between the other candidates, who "all look the same". The 57-year-old Cambridge graduate, who became the UK's first black woman MP in 1987, said she was getting support from female and left-leaning colleagues. She is the sixth person to enter the race after David and Ed Miliband, John McDonnell, Ed Balls and Andy Burnham. Contenders have until Thursday 27 May to gather the backing of 33 Labour MPs - a timetable some have said is too tight, particularly for less high-profile candidates. 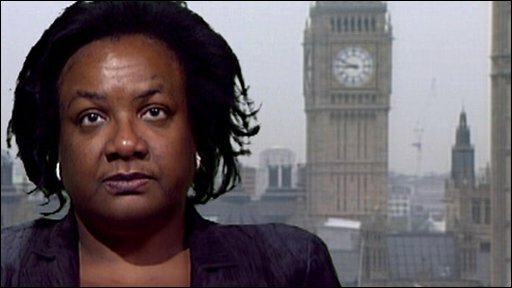 Ms Abbott, the Hackney North and Stoke Newington MP, who in recent years has been a fixture on the BBC's This Week programme, said: "So many people have asked me to stand. "The other candidates are all nice and would make good leaders of the Labour Party but they all look the same... We cannot be offering a slate of candidates who all look the same. The Labour Party's much more diverse than that." She added: "I looked at the field and said 'If not now, when?' And 'If not me, who?'" Ms Abbott said: "It's important that we recapture the civil liberties agenda from the Tories and the Lib Dems. "It's important that we re-energise the party and bring democracy back to the party. "We need a proper debate on immigration, where children of immigrants like me also have a voice." Ms Abbott said she wanted a "proper debate" on tackling the budget deficit and whether this should be achieved by raising taxes or cutting spending. At the general election, she increased her constituency majority to 14,461, with a swing to Labour from the Liberal Democrats. Former Health Secretary Andy Burnham, 40, announced his intention to stand for leader and "rebuild the party for new times" in an article for Thursday's Daily Mirror newspaper. He said the party owed a "debt of thanks" to former prime ministers Gordon Brown and Tony Blair but said he would end "stage-managed" politics. On Wednesday Ed Balls launched his campaign, saying he wanted to "listen first, hear what the public say". The close ally of Mr Brown said the contest was not about "Blair versus Brown" or "old Labour versus new Labour". Left-wing MP John McDonnell said he wants to stand but the timetable makes it "almost impossible" and argues the process has been "stitched up from the start". Ed Miliband has also said it should be longer. On his Twitter page, he wrote: "MPs/members annoyed about short nominations timetable: I have to say I agree. Need broadest possible choice & time for MPs to decide&consult". The five candidates in the race to be the next Labour leader.